I've never seen a tag synonym created via the voting mechanism and I see evidence that the system isn't working to create synonyms without moderator intervention. Does anyone have any figures about the number of synonyms that are create by votes as opposed to the number created by moderator fiat across the network? Related: how many synonyms have been voted down and how many never get any votes at all? Finally, do the numbers suggest any way the current system can be improved? Should the suggestion system be scrapped altogether? As a side note, the tag synonym suggestion system on most meta-sites seems unlikely to ever work since voting is different on meta and fewer people participate there. Recently, I noticed a site had both tags and tagging. With a tag score of 2, I couldn't suggest a synonym. Even if I could, there's no chance it would be acted on by other users. So I asked a moderator in chat to fix it. That was a better plan all along, so why do we offer the suggestion system on meta to be a source of false hope? Clearly, the vote requirement exists to make sure that the synonyms are correct (ie created by one who has knowledge of the topic). To my experience, this system fails, because most synonyms are discovered by coincidence. (Temporarily) retag a question, on which you've posted an answer with at least 5 upvotes. Wait a little bit, then suggest / vote on a tag synonym. I haven't practised this idea yet, because it doesn't feel OK to deliberately add wrong tags to a question, polluting the revision history of the question. How do you (the Community) rate at this approach? Allow users with sufficient reputation (10k+, 15k+, 20k+?) to cast (a half?) vote on the tag synonym. This is based on the fact that reputation is a "measure of how much the community trusts you". Allow users with sufficient votes in the tag cloud (related tags) to vote. This concept is based on the assumption that tag synonyms usually have an overlapping tag cloud, and the likelihood that a tag synonym is found on a question in your field. The existing 3 synonyms I asked for in the Tavern on the Meta (prior to receiving 2500 reputation) and a mod kindly made the change. I do not believe a standard review queue would work. If it is anything like the Suggested Edits or First Posts queue, then there will be a lot of mindless clicking of accept resulting in a lot more of an issue than an inappropriate edit, or a poor quality post. And that isn't the goal. If anyone can click accept and improve the system, then suggested synonyms shouldn't be suggested at all, and just be accepted straight-up. So Johnny can retag his old questions with the new tag, get the 5 score, and then suggest the synonym just to meet this arbitrary requirement. Those edits will be entirely useless when the synonym gets approved. Making those edits to his old posts will not improve his understanding of the tags in the slightest and will simply add another hoop for him to leap through. Alternatively, he could suggest that puroguramu-gengo is actually a synonym of programming-language, but this is definitely not actually true. But at least it could be proposed! And there would be more people able to actually accept it because it is the existing tag with more people paying attention to it. But this is not a solution, it is a problem masquerading as a solution due to it being a practical alternative. Giving users who have the tag favorited will give them an opportunity to click the notification and vote. This is an incredibly non-intrusive way to let people know about tags they have already stated they care about, and potential ways to improve them. You can raise the bar for how many votes it takes to account that some people won't think in depth, users can ignore it and it won't come back, and it will only target people who are currently interested in the tag and can do something about it. Improvement becomes easier while minimizing the hassle to the user. To analyze this, I used the Stack Exchange Data Explorer to classify tag synonym suggestions into three categories: approved by vote (approved with score >= 4), approved by mods (approved with score < 4), and pending. As far as I can tell the data explorer doesn't include information about tag synonyms that were rejected. Among the pending flags on Stack Overflow (the only site with more than a handful), there are 50 with score -1, 449 with score 0, 134 with score 1, 81 with score 2, and 36 with score 3. Why Don't More People Vote on Tag Synonyms? I think the high rate of approval by mods is because folks go straight to meta with their synonyms, perceiving that their proposal will otherwise languish in the proposed tag synonyms list. It has certainly been my experience that tag synonyms languish in review, and jmac estimated that on average pending synonyms have been around for nearly half a year. Why not go straight to the mods if you have to wait half a year or more for approval? For 8% of pending synonyms, there is no hope of approval because there aren't four eligible voters on the site. 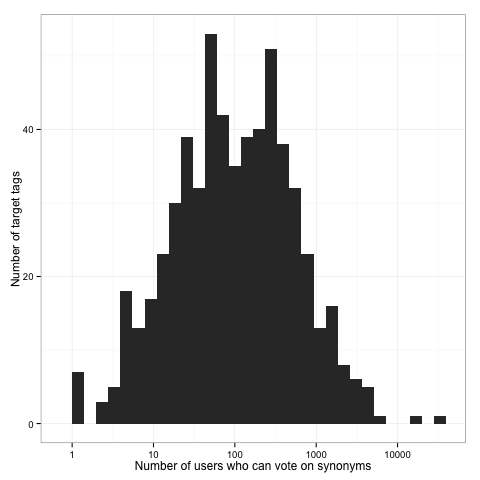 14% of pending synonyms have 10 or fewer potential voters, so they aren't likely to get approved by vote. On the other hand, many pending synonyms have a large number of potential voters -- 47% have at least 100 potential voters and 8% have at least 1,000 potential voters. Create a badge for voting on tag synonyms, as proposed here. The "go get it" link from a user's profile page could link to the list of tag synonym proposals that the user can vote on. Create a tag synonym review queue, as proposed here. The badges that exist for all review queues could be applied to incentivize voting. User interface improvements such as notifications for tag synonyms you can vote on and a link to pending synonyms when browsing a tag, as proposed here. Who decides whether a tag gets cleaned up, and how? Create tag synonym between “newline” and “line-breaks”?